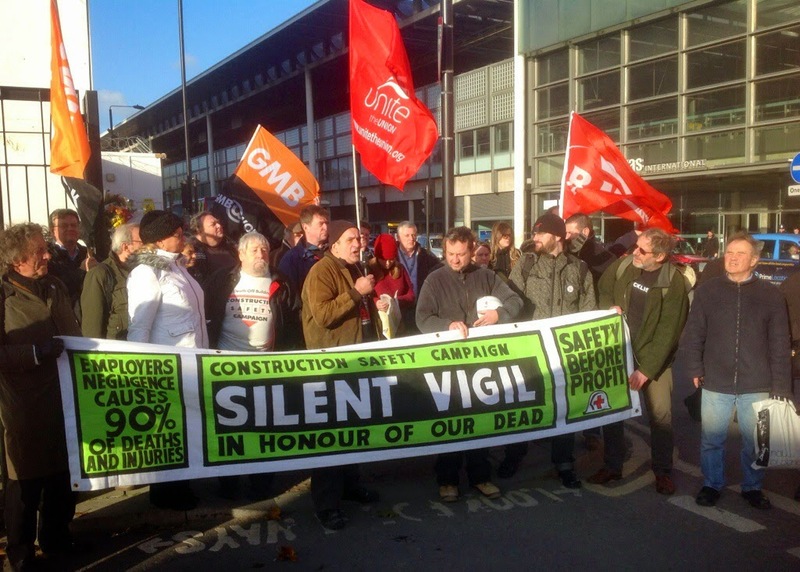 WORKERS fighting against the blacklist in the building industry are angry that the Metropolitan Police would ‘neither confirm nor deny’ that Special Branch and undercover cops have been snooping on the Construction Support Group. The raid on the Consulting Association, a successor to the notorious right-wing Economic League, revealed that data was illegally stored on thousands of people, concerning their personal and family life and trade union or political activities. Not all were building workers. The companies who subscribed to this service were also interested in environmental campaigners. They also apparently discussed what could be done about a Glasgow university who reported unfavourably on safety in the North Sea oil industry after the Piper Alpha disaster. But building workers were particularly vulnerable because of the nature of the industry. What has happened is that a trade unionist who tries to organise colleagues on a site, attends meetings, or simply tries to raise concern over health and safety issues at work, is not only liable to be victimised, but becomes the subject of a secret report which follows him or her through life. They can no longer get a job even when there is work about, and of course their families suffer. If the Special Branch or undercover cops are spying on those who campaign against the blacklist, then as has been revealed in the Stephen Lawrence case, the police have been pursuing the families of the victims of crime, rather than the perpetrators. As for the claim that they cannot admit anything or disclose documents, on "national security" grounds, this is the very same pretext that government has been using for refusing to release documents on the Shrewsbury building worker pickets that were jailed. It is as good as an admission that so far as police and the state are concerned, workers who fight for their rights are still what Thatcher called them, that is us, the Enemy Within. It has been evident all along that whatever the law may say, and whatever we may be told about "equality before the law" and the police force being neutral, the state and private sectors of the snooping industry have been working hand and glove. A Commons Select Committee investigation found that the undercover police unit known as the National Extremism Tactical Coordination Unit (NETCU) attended and gave powerpoint presentations to meetings of the Consulting Association blacklisting organisation. The head of the covert blacklisting organisation, which was financed and controlled by major construction companies, was prosecuted for holding illegally files on construction workers. Construction firms paid on a case-by-case basis for frequently inaccurate information contained in these files. The difference between this and the police activity is that whereas the bosses paid for the Consulting Association and private detectives etc, we the public are expected to pay for the Special Branch and other agencies to spy on ourselves! And we are not allowed to see the results. It is evident from some of the Consulting Association files revealed that their material did not just concern workplace activity or come from employers sharing information. Supt Steve Pearl, who ran NECTU, is now a director at Agenda Security Services, which provides employment vetting services. His former boss, ex-Assistant Chief Constable Anton Setchell, who was the senior police officer in charge of the UK police domestic extremism machinery between 2004 and 2010, is currently head of global security at Laing O’Rourke – one of the construction companies subscribing to the Consulting Association. Following exposure of how the police Special Demonstrations Squad and other secret units conducted undercover - and under- the -covers - spying on women activists, the High Court ruled in September against them using the "neither confirm nor deny" formula. Some women currently suing the Metropolitan Police are also on the Consulting Association blacklist. number of campaigners who have been refused copies of their own personal police files. Besides seeking legal redress from companies which blacklisted him and others, Dave continues to publicise the issues, and has asked friends to share the photograph above of what happened when he went with fellow-campaigners to the headquarters of the big construction giant Laing O'Rourke recently. VIGIL FOR RICHARD LACO, killed on Laing O'Rourke site. As I've said, blacklisting is often linked to another issue in the building trade, and that is safety, or the lack of it. The accident rate can even go up when times are hard, because bosses are anxious to cut corners and be competitive, firms push bogus self-employment making workers responsible for their own protection, and workers fear speaking up about conditions and ways of working will result in their being singled out as "troublemakers". Certainly many of those who found themselves on the Consulting Association files appear to have committed the "offence" of becoming safety reps. Yet with already insufficient HSE inspections being hit by cuts, the government of Old Etonian toffs who have never done a day's work proclaiming building and other industries "safe", and even regulations like those on asbestos being undermined, the need for workers to organise, and protect their safety at work, has never been greater. Anyway, seeing that photo of the brother being manhandled from Laing O'Rourke's headquarters reminded me of another protest, that I attended. It is almost a year since Richard Laco, a 31 year old labourer, was killed by falling steel and concrete on a Laing O'Rourke site at Kings Cross. Union officers revealed they had not been allowed on site, where the company has a £600 million contract to build the Crick medical research centre. Nor were Richard Laco's workmates allowed off site to join a vigil outside the gate. The management claimed they were holding their own event on site, but Richard's gilfriend was not allowed in, and had to plant her wreath of flowers with others at the gate. Five years ago Laing O'Rourke were fined over the August 2005 death of a worker at Heathrow. The firm was prosecuted by the Health and Safety Executive along with SGB Services Ltd, a supplier of construction equipment. Both pleaded guilty to breaching the Health and Safety at Work Act. Laing O’Rourke Infrastructure Ltd was fined £75,000 and ordered to pay £75,000 costs. SGB Services Ltd was fined £30,000 and ordered to pay £30,000 in costs. Matthew Gilbert, a 27-year-old carpenter from Plymouth and a 21-year-old engineer’s assistant, Parminder Singh, from Slough, had been standing on a concrete slab when it collapsed and fell 17 metres to the level below. Gilbert was killed in the collapse, while Singh suffered extensive scarring, along with a broken back, broken leg and a broken jaw. The court heard that SGB failed to ensure Threaded Shoring Adaptors, TSAs which they supplied were able to carry maximum loads. The company had carried on supplying defective TSAs despite a recall programme, and two of these failed, causing the concrete slab to collapse. The HSE investigation also found that Laing O’Rourke Infrastructure Ltd failed to have adequate systems in place to inspect the quality and condition of the TSAs before they were used in safety-critical applications, and had failed to remove sub-standard TSAs from use when warned. Another Laing O'Rourke worker was killed at Heathrow at the beginning of October. Philip Andrew Griffiths, 38, who had been working on the airport's terminal 2 car park on night shift, was hit by a dumper truck that was being used to move a broken down hoist. A Met Police spokesperson said: “Police were called by London Ambulance Service at 04:46hrs on Thursday, 2 October to Cayley Road, close to the Ground Floor Car Park at Terminal 2, Heathrow Airport, following reports of a road traffic collision. “Officers attended and found a man in his thirties suffering serious injuries following a collision with a truck". The victim died shortly before 5.45. Laing O'Rourke say they are aiming to eliminate all accidents not just the fatal ones on their sites. Perhaps they genuinely are. But I'd sooner trust workers' self organisation, trade unionism, and safety representatives, along with campaigning for a change in policy and government, for that "health and safety culture" that David Cameron and his friends despise. How much independence can you have with TTIP?